"When our class visited JAXPORT, we were able to see and learn about many new and unfamiliar things. For each student different things sparked interest or inspiration. Some were inspired by the rail cars and train tracks, some the marsh land while others were inspired by the ships and cranes. Students sketched that which inspired them and discussed the subject of this inspiration with each other. We brought each of our individual experiences and inspirations into the classroom and what emerged was an overarching idea of textures, shapes and patterns that were a part of the many sights. In order to highlight these textures and patterns, the students created printmaking blocks by carving their designs into foam sheets. They then used a traditional printing process to print these blocks into the pieces you see on display. With this process, the image can be printed multiple times. Earlier in the year, our class studied Origami, the Japanese traditional art of paper folding. During this study we created paper cranes (birds). With the upcoming JAXPORT show, we wanted to honor the birds and wildlife of JAXPORT and the marsh lands that surround it while also highlighting their environmentally conscious practices by creating paper cranes using old annual reports given to us by JAXPORT. We created some on unpainted paper and some paper we painted with watercolor paints, then created the cranes. We wanted these to seem like they were a flock of birds flying through the gallery. As a final art piece of our class and a culmination of our JAXPORT experience, the students were able to create an art piece about JAXPORT using acrylic paint and a "reverse color" painting technique in order to create more depth and interest in the art piece." The vision at Cathedral Arts is for every child to have access to a well-rounded, arts-rich education that endows his or her spirit with the imagination, self-confidence and strength of character that inspires great leadership and a will to succeed. Cathedral Arts provides twice-weekly after-school and summer programs in dance, music, drama and visual arts to 1,450 students throughout Jacksonville each year. Areas of instruction include ballet, West African dance, drumming, violin, chorus, acting, painting, sculpture and ceramics. For additional information and/or images, please contact Meredith Fordham Hughes by email or by phone at (904) 357-3052. 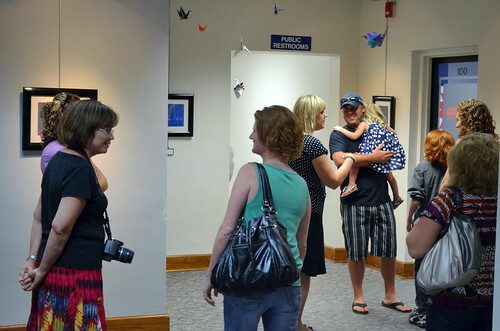 Located on the first floor of JAXPORT Headquarters, the Gallery features local artists rotating on a bi-monthly basis. JAXPORT Gallery is open during normal JAXPORT Headquarters hours and admission is free. Learn more about JAXPORT and the Arts.